Dust off your sombreros because we're going to fiesta like there’s no manana at State Line Showgirls! 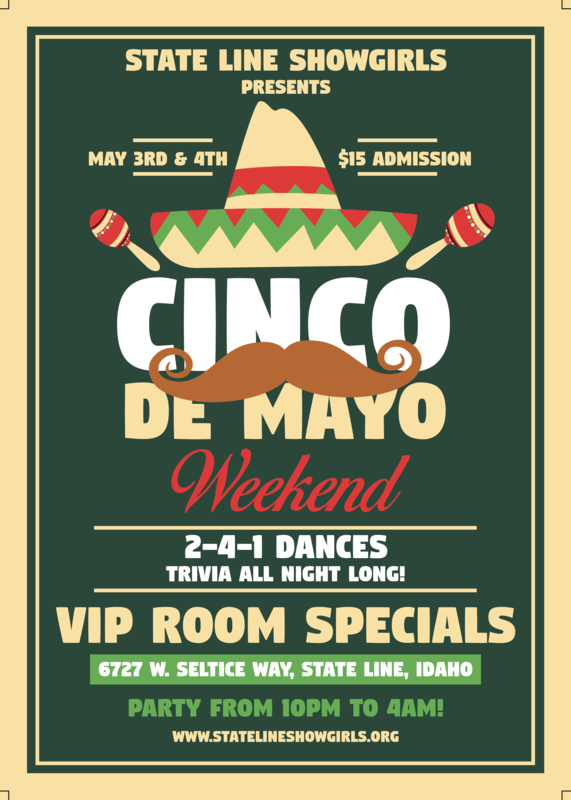 Celebrate Cinco De Mayo with the most beautiful Showgirls in the Inland Northwest. Our doors are open to party-goers 18-years of age and up that have an appetite that only State Line Showgirls can satisfy. Our Cinco De Mayo parties will be from 10 pm to 4 am on Friday, May 3rd and Saturday, May 4th, 2019! For a more exclusive experience, enjoy the company of your favorite State Line Showgirl in our Hideaway VIP Room. Take it to the line on Cinco De Mayo!